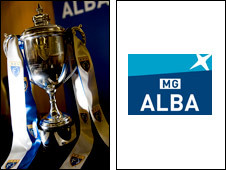 Two late goals for Ayr United gave them victory against Airdrie United in the first round of the ALBA Challenge Cup. After a goalless first half, Gary Muir scored from the spot after Ryan Wallace had been felled by William Easton. Alan Trouten converted Easton's cross from to level matters in 83 minutes, then Andy Rodgers headed a second. The match was played at Alloa's Recreation Park while the new artificial surface is laid at Airdrie's Excelsior Stadium. Airdrie United: Ridgers, Bain, Gibson, Grant, Lovering, Muir, Stallard, Devlin, Burns (Morgan 84), Wallace, Anthony Watt (McCabe 72). Subs Not Used: Tobin, Cane. Booked: Burns, Devlin, Grant, Lovering. Ayr United: Crawford, Tiffoney, Smith, Donnelly (Aaron Connolly 46), Campbell, McLaughlin, Trouten, Woodburn (Robertson 75), Rodgers, Roberts (Paterson 75), Easton. Subs Not Used: Fisher, Jones. Goals: Trouten 83, Rodgers 87.